The recipes in this site are ones that are popular with friends and family. Some I have come across in one form or another over the years, and modified. Others are my own inventions, tested on forbearing friends and family. My interest in baking started in the mid 1970s in Staffordshire, as a young wife learning to cook on a tiny student budget. 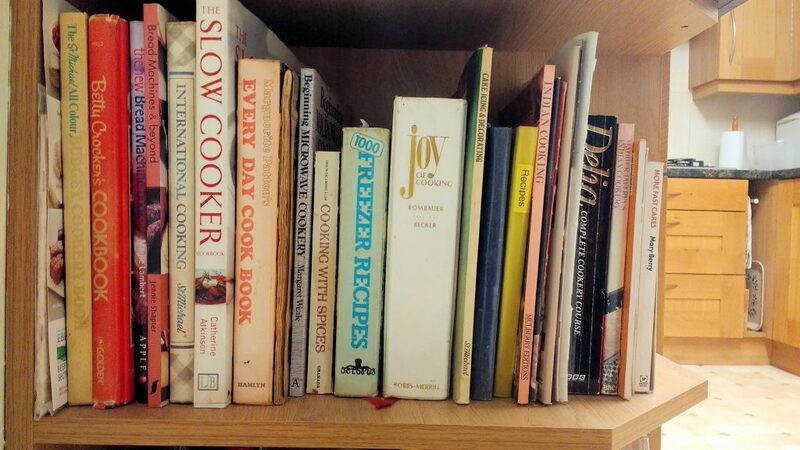 Mostly I was using English cookbooks which I struggled to understand (eg what is ‘shortcrust’?). 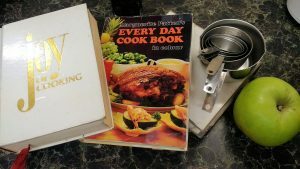 And when I referred to my American cookbooks, I couldn’t find the ingredients in the shops or market (like bitter baking chocolate, or soured cream). My ‘Joy of Cooking‘ classic has a wonderful section in the middle that describes ingredients – the different kinds of sugar, salt, flour, water, milk… and how each behaves in cooking. It also has a table of equivalents and substitutions. So early unavoidable experimentation led to later deliberate and more creative adventures. And my ‘Every Day Cook Book‘ by Marguerite Patten helped me develop a UK cooking vocabulary. Converting my mother’s brownie recipe to one I could make with UK ingredients was a great success. And developing a chocolate cake recipe that had all the chocolate flavour I had grown up expecting, but without all the fat of a Victoria sponge (which is a light-textured Pound Cake). Some British recipes were adapted to the family’s taste, like Flapjacks and Apple cake. So have a go for yourselves. Some variations are suggested, no doubt you’ll think of your own also. Keep in mind that ovens vary, and the temperatures and timings are the ones that work for my own oven – you may need to experiment with yours.